But look at the disparity that emerges when those results are sorted by party affiliation. While support for Israel vs. the Palestinians has climbed to a stratospheric 85 percent among Republicans, the comparable figure for Democrats is an anemic 48 percent. (It was 60 percent for independents.) And behind Israel’s “Top 5” favorability rating lies a gaping partisan rift: 80 percent of Republicans — but just 53 percent Democrats — have positive feelings about the world’s only Jewish country. Taken as a whole, America’s identification with Israel is as stout as ever — the “special relationship” between the two nations still runs deep. But the old political consensus that brought Republicans and Democrats together in support of the Middle East’s only flourishing democracy is breaking down. Republican friendship for Israel has never been more rock-solid. Democratic friendship — especially now, in the age of Obama — is growing steadily less so. 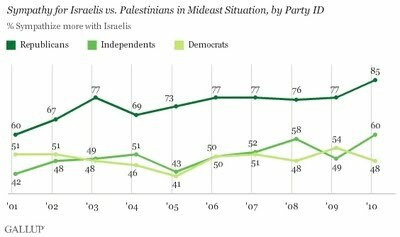 I am not sure why Republicans are more supportive of Israel than Democrats, but the results of the surveys are interesting. Perhaps someone will come up with an explanation.